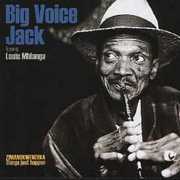 Aaron “Big Voice Jack” Lerole was one of the most influential kwela stars and, in a revival of his popularity that is described in Keith Addison’s 1998 article ‘Return of the Big Voice‘, must have been one of the last of the originators to still be recording. The legacy links below are broken (for now) – sorry. In which we meet Jack and members of his old band, Black Mambazo, talking about the Old Days; we hear Jack interviewed by ALX FM about his trip to the USA with the Dave Matthews Band; we see Jack’s journey from SA to the USA (three months earlier). In which we watch Jack, Dave, Leroi and the rest of the band prepare for the performance; we watch the band’s dramatic arrival at the stadium on show-day; Dave explains how the link-up with Jack began. In which we see Dave teaching Jack “One Sweet World”; we see Jack in action on the stage; then a flashback to Jack and the Shukumo Mambazo Allstars at the Bassline, whilst Jack reminisces about life in the Dark City. In which Jack explores New York and thinks about how long it’s taken to get this far; we’re taken back to the rehearsal at the Giants Stadium where Jack’s “Back to Alexandra” is added to the set list. In which we watch “Back to Alexandra” performed, including Jack’s signature two-whistle playing; then, one year later we see Jack leaving his home in Diepkloof, Soweto (where he was forcibly relocated in 1959), to rehearse with his band Shukuma Mambazo and teach children at Diepkloof Hall (community centre). In which we watch a rehearsal of Shukuma Mambazo, a kwela lesson with children and a kwela street procession in Diepkloof.